FireBox BBQ at 347 Great Road is getting a full liquor license. The restaurant which currently has a Beer and Wine License, is planning to add a small bar area at the back of the restaurant and will be making a few updates to it's menu. According to the Bedford Town Website, there are currently 12 All Alcohol Licenses in use for Restaurants and Hotels in Bedford, with 2 additional available. While Bedford currently has licenses for it's 3 full liquor stores, there are 5 beer and wine licenses available for retailers. In the past few years, both Whole Foods and Bedford Express Gulf have applied for a Beer and Wine License but were voted down by the Town Selectman. Recently many local towns have granted additional alcohol licenses for restaurants citing economic development. For example Burlington recently granted 10 additional licenses for the Third Avenue development project at Northwest Office Park and Waltham is considering adding 15 more licenses. I'm wondering if the additional .75% local meals tax added in 2010 played a role. A mixed use project is being proposed for 54 Loomis Street. Details are very preliminary but the project is expected to contain some retail. The building which was previously occupied by Pharmalucene, is about 12,000 square feet and sits on a 45,000 square foot lot close to Bedford Depot Park. The site is currently assessed at just over 580K. This property is located in the new overlay district zoning that was created for the Bedford Depot Park area and may used for retail purposes such as a store or restaurant. What would you like to see replace the old building? Riggio Auto at 180 Great Road is in the middle of replacing their underground fuel tanks. 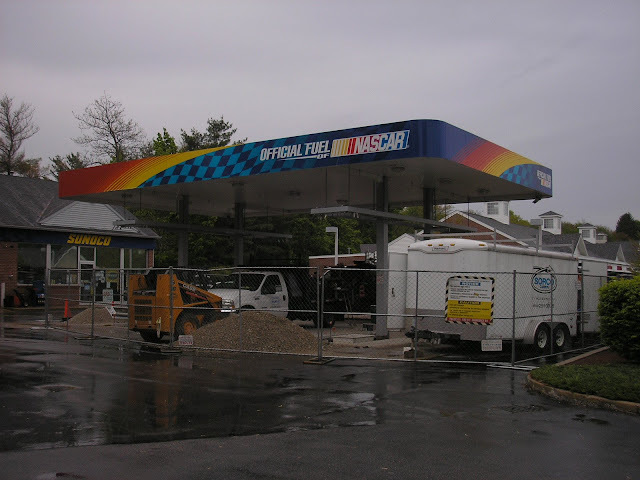 As part of this process they are getting all new gas pumps. According to employees, the new pumps will dispense gas faster, decreasing fill up times. The work is scheduled to be completed around May 15th. New fuel pumps are being installed by Sorco Corporation. While the station is not currently selling gas, the service bays and convenience store are still open.